Amethyst is a semi-precious variety of the mineral quartz, well-known for its beauty and striking purple color. While the gemstone can be found around the world, it is most common in Brazil, Uruguay, and Zambia, where it is carefully extracted by hand from underground geodes. 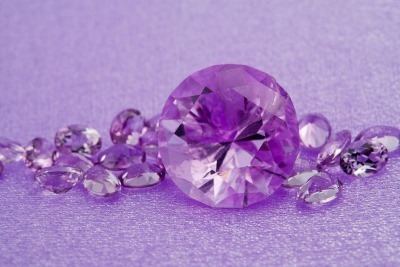 Traces of Amethyst being used for wellness maintenance can be found throughout history. The ancient Greeks and Romans wore the stone to ward off intoxication and maintain clarity of mind. The ancient Egyptians carved amethyst stones into amulets to protect themselves from harm. Early Christians, who considered the gemstone a symbol of purity and spirituality, used amethyst as an aid for wounds, fatigue, and fevers. Most of these tales share a central idea about amethyst: it balances mental, physical, and spiritual wellness levels. How does amethyst produce these effects? Through two natural processes: negative ion emission and the release of far-infrared radiation, two therapies found in nature that are necessary to maintain the quality of human life. Ions are simply molecules with a positive or negative electrical charge. Negative ions are created naturally all around us every time a molecule breaks apart, typically due to sunlight, radiation, and moving air or water. In natural environments like the beach, the forest, or the mountains, we are surrounded by negative ions. We often feel the effects of those negative ions immediately, by way of improved mood or increased energy after spending time in nature. When heated, amethyst naturally emits negative ions. Negative ions improve your wellness levels to assist the body in the removal of toxins and deliver oxygen and nutrients to the bloodstream. Amethyst’s emission of far infrared rays intensifies its benefits. Far infrared rays produce the “warm energy” that exists in all living things. On a sunny day, we can feel far infrared rays in the form of deep, internal warmth. Far infrared rays have powerful positive effects on human wellness; when combined with amethyst, its effects are even more significant. If you would like to see our selection of Amethyst mats, check out this page. You can learn why HealthyLine’s PEMF and FIR mats are so much better than anything else available on the market, please read this article. Healthy Line offers the world’s widest selection of high-quality Far-Infrared heating mats, made with natural gemstones. 2019 (c) Healthy Line. All Right Reserved.